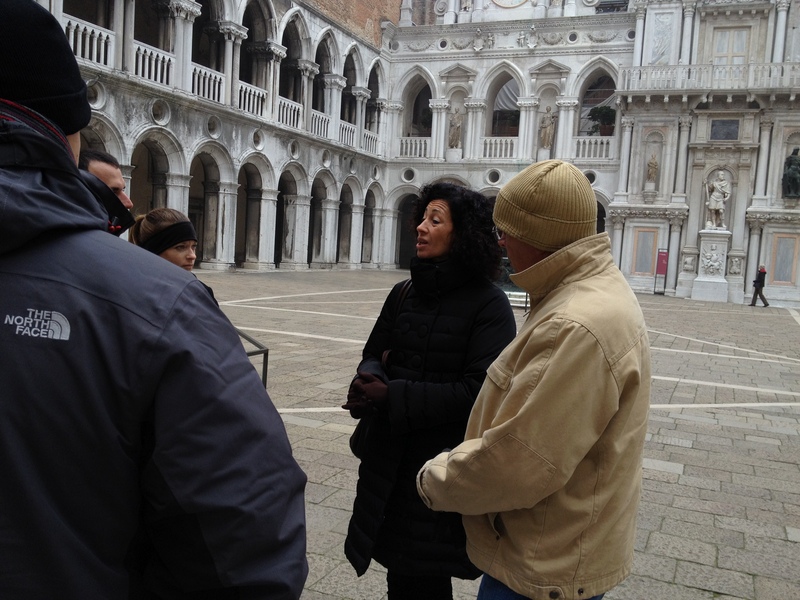 Engaging a private guide was one of the wisest decisions we made during our time in Venice. Because our stay was brief—about forty-eight hours—we wanted to maximize every opportunity, and see and learn as much as possible. We booked a three-hour morning tour with Elisabetta Morelli, a proud Venetian who is extremely knowledgeable about the history of her beloved city. She was highly recommended to me by a personal friend who had engaged her services a year or so earlier. Elisabetta is also recommended by Rick Steves in his Italy guidebook. She met us at our hotel and gave us a thorough overview of the history of Venice before we set out to our first destination—the Doge’s Palace. The tour was highly informative and encompassed the outer courtyard, the Golden Staircase, and the inner chambers, as well as the Bridge of Sighs and the New Prison. From there, we went to St. Mark’s Basilica. Though a private tour can be fairly pricey when compared to standard group tours, the setting is more intimate and your guide is better able to answer questions readily and thoroughly. It is, therefore, well worth the added expense. I communicated with Elisabetta via email prior to our arrival in Venice. Her responses were prompt and informative. We found her to be personable, spunky, and enlightening. If you are interested in booking a tour with Elisabetta, she can be reached at bettamorelli@inwind.it, or if you prefer to telephone her, call 041-526-7816 or 328-753-5220 (cell). She speaks Italian and English. There is a two-hour minimum for tours; she accompanies families (including children) and other small groups. The cost is 70 euros per hour. I highly recommend a private tour of Venice, and enthusiastically endorse Elisabetta Morelli as a fabulous guide! The 55th Doge unsuccessfully plotted a coup and was executed. The Hall of the Great Council boasts an elaborate frieze of paintings depicting the first 76 doges–except for the 55th Doge, whose place on the wall is covered by a black veil. He was condemned to “Damnatio Memoriae,” whereby all memory of him was expunged from history–officially, anyway. A “Lion’s Mouth” postbox is located near the court chambers inside the palace. It is locked and can be opened only from inside the palace–with a key. It was placed there for informants who wished to deposit anonymous denunciations into it. Translated, the text reads… “Secret denunciations against anyone who will conceal favors and services or will collude to hide the true revenue from them.” The early version of Big Brother! We crossed the Bridge of Sighs, which connects the interrogation rooms in the Doge’s Palace to the New Prison. The bridge name–given by Lord Byron in the 19th century–comes from the idea that prisoners would sigh as they glimpsed beautiful Venice for the last time as they crossed the bridge into the prison. Local legend says that lovers will be granted eternal love and happiness if they kiss under the bridge in a gondola at sunset as the bells of St. Mark’s Campanile toll.